Make sure your headset's display cable is plugged in correctly." I've checked multiple times, restarted multiple times, etc. - nothing seems to work. Does your USB 3.0 port provide sufficient power? USB port must supply a minimum of 900mA for the headset to work. If it doesn't headset won't work even-though it shows up on device manager. Same problem here with HP Head Set insider build 16257.1. On device manager the "Mixed Reality headset" looks good (detected). Jesus - if you "VOTE UP" my original post, it'll get traction faster. Great question... any idea how to check/verify that? I tried another USB 3.0 port, and it worked. 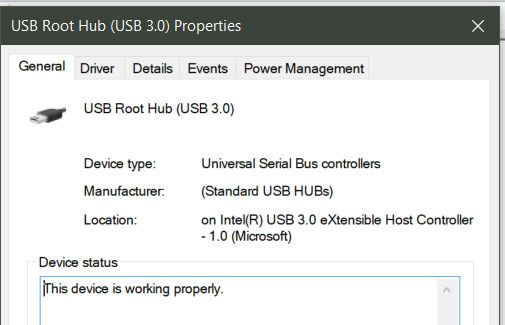 I have TWO different USB 3.0 hubs... one of them fails on all four USB ports, but the other one seems to work fine. If all other USB port fails, solution could be to get a non-Asmedia USB controller USB 3.0 PCI-E card with power plug that can provide enough power to the headset. Ive noticed this as well, before the insider edition update it seemed to pickup but after enabling the insider edition this happens every so often. If the HDMI cable is unplugged and plugged back in, this seems to help if it doesnt, do bot HDMI and USB and if that doesnt work a restart does the trick. Yep...I was having same issue. Checked power of USB and they are all 500. Question. If I get a external usb hub that has actual power adapter, can I plug it into that? Well my Samsung was working, but then the USB-C to HDMI adapter got quite hot and now I get the display not recognized error. Brand new Surface Book 2 so the USB power spec is fine, and was working for two days ... so is this Power Management or a fried adapter? You probably fried your adapter. After two hours my HDMI 2.0 4K UHD adapter cooked because the device is a stub and there is no where for the heat to go. Now got an adapter with small cable between works fine as heat dissipates easier. I am having the same problem. I plug everything in properly, it runs set-up compatibility test and says "you're good to go" but when I click next it says "check your display cable make sure your headset's cable is plugged in correctly" I am not sure why it detects the headset is connected and then tells me it is not. I just got this Saturday so I haven't had time to do anything that might have damaged it. Same for me Surface Book 2 13' Lenovo Explorer. Recognised and installed but no video output on headset. Used Microsoft USB-C to HDMI but no success. I have Alienware alpha R2. Intel I7/16Gb RAM/ NVIDIA GeForce GTX 960 video. Not using any extensions for HDMI or USB. All checks are good until visor test. It says "Make sure your headset's display cable is plugged in correctly.". I've done all the recommended fixes. With the headset plugged in before power up all I see is "alienware" in the headset during boot up then it goes dark. The video recommended(not required) is GTX 965s. Is this the issue? I was told by Dell rep during online chat that it should work still. Anyone have any other trouble shooting tips or is it time to box up and return? I have the controllers too, but haven't opened the box. If the visor won't work what's the use. Please share any tips tricks or hacks. I'm trying to get this to work with X Plane11 and Flight Sim World(FSW). i have the same problem it says in my device manager that it is a hololens sensor .Did anyone get a fix for this? There a service called windows perception service restarting this seems to fix connect your display cable. I think the headset needs to be detected by graphic card before windows perception service starts. simple way to see if windows perception service is the problem is open task manager by right clicking windows start menu in left bottom corner then clicking task manager or the usually way of ctrl+alt+delete. Now when task manager is open go to services then look for a service called spectrum right click it and click restart. When restarting make sure everything is connected. If this fixes problem then you can either do this everytime to fix problem or change service to automatic delay or manual.